Most cocktail recipes suggest a style of glassware that is typically used for that drink. This glassware tour will give you an idea of the basic shapes for each style of glass. You will also learn how many ounces each glass typically holds and which types of drinks each is used for. I have also marked a few of the glasses as a "Must-Have" for the well-stocked bar. 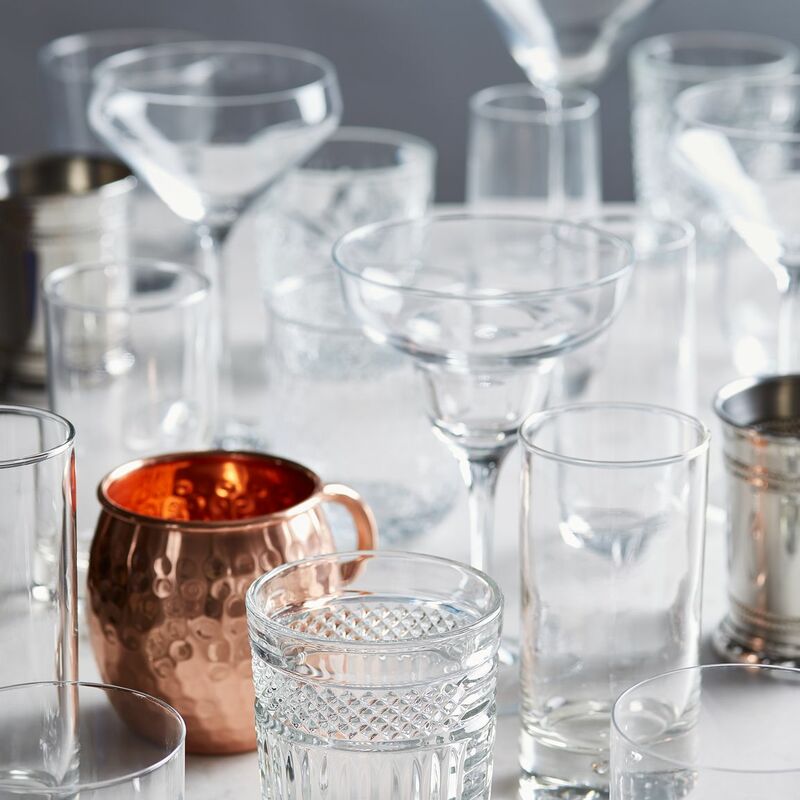 Use this feature to choose the essential glassware to buy for your new bar. When shopping for glasses, you will find a variety of designs within each style and this is half of the fun. Look for interesting features that match your bar's style. Don't be afraid to shop second-hand sources. You will find some of the best designs in vintage glassware. Stay away from the very thin glass. They will break easily and this applies to the stems as well. I have had the stem of a cheaply made margarita glass literally twist off while washing it. Pay attention when hand washing glassware. Dishwater is the last place you want you want to break glass! Did you break a glass? Pick up little shards of glass with white bread (seriously!). Rinse your glasses thoroughly to remove soap. Dry your glasses immediately to avoid water spots. Never put wet glasses away in the cupboard or glass rack. It can ruin surfaces and there is a potential for mold. It is best to store glasses upside down. This prevents dust and debris from collecting inside. Also, stemware like cocktail glasses are top-heavy and can easily be knocked over. Displaying your glassware in full view? Don't forget to dust them! Consider a glass rack for your stemware, it may end up saving space. Remember that cocktail and margarita glasses are wider than wine glasses. Make sure the rack accommodates those styles or purchase individual racks and space them accordingly. The familiar conical shape of the cocktail glass makes most of us think of a Martini, and so it should. It is the most popular drink that is served in this style of glass and because of that, many people will call this a 'martini' glass. Cocktails between 3 and 6 ounces. Most often served 'up' without ice. The variety of martinis, many classic cocktails and almost any short drink. Cocktail glasses come in many different styles, including frosted, painted, and fun stem shapes. If I were a glass designer, this would be my favorite style to play with! Though it is now common to have stemless cocktail glasses (pictured on the right), the stem serves a purpose: it allows the drinker to hold the glass without warming the drink via body heat. This is essential to keeping these non-iced drinks colder for a longer period. As with margarita glasses, some cocktail glasses can come in very large sizes, even reaching 10 ounces. This is overkill because the drinks typically poured into a cocktail glass are made primarily of liquor. For example, the Manhattan is 60 proof once it's mixed, which is just below bottling strength of the average whiskey. Now, compare that 3-ounce cocktail with a 1 1/2 ounce shot of straight 80-proof whiskey. The volume makes up for the difference in alcohol content. Besides, by the time the drinker gets to the last few sips, the cocktail will have lost its freshness. Stick to cocktail glasses that are no more than 6 ounces. Even if your drink is only 3 or 4 ounces, the extra room gives you a little splash protection when carrying it around at a cocktail party! The highball and collins glasses are very similar to each other. In the photo above, the glass on the left is a collins glass and the one on the right is a highball glass. These two glasses hold around the same volume, between 8 and 16 ounces. The collins (left) tends to be taller and more narrow, more of a chimney shape. The highball (right) tends to be stouter and usually tops off at 10 ounces. The glass in the middle is an example of a hybrid of these two glasses: the same volume with a little detail in the style. The highball (or hi-ball) glass is a style that every bar should have. The collins glass is not necessary, though convenient. The two can be used interchangeably. These tall glasses are typically used for 'tall' mixed drinks (or 'highballs') and filled with an abundance of ice. Quite often, the drinks are built directly in the glass by pouring the ingredients over top of the ice and stirring. The simplest of these drinks include a shot of liquor topped with fruit juices and/or sodas to fill the glass. The old-fashioned glass is a short tumbler that is also often called a "lowball" or a "rocks glass". These glasses are typically used for short mixed drinks that are served with ice (aka 'on the rocks') though not always. Popular lowballs like the White Russian, Rusty Nail and, of course, the Old-Fashioned. Old-fashioned glasses hold between 6 and 8 ounces. They are also available as a double old-fashioned (left of the photo), holding up to 10 or 12 ounces. The smaller old-fashioned glasses can be used for serving a straight or neat pour of liquor, typically a dark spirit like whiskey. The doubled old-fashioned glass is ideal for serving either a mixed drink or straight pour of liquor with a single large ice cube or ice ball. The shot glass is a very recognizable glass in the bar. They can come in many styles, shapes and sizes and are fun to collect. Any shot glass can be used to hold straight shots and mixed shooters and it is always good to have quite a few around just in case some break. The average shot is 1 1/2 ounces while a 'short shot' or 'pony shot' is just 1 ounce. The typical shot glass is made of thicker glass, particularly on the base. This reinforcement is designed to prevent it from shattering when the drinker slams the glass onto the bar after downing the drink. The two glasses on the right are the typical style of shot glass. They are good for straight shots of liquor or shooters that are shaken and strained. Despite the size difference, these two glasses hold the same amount of liquor (I measured them). Glass design can be deceiving and this is something to be aware of in both shot glasses and beer mugs, particularly at the bar. The taller, thinner shot glasses on the left are more of a specialty. Use these to show off those perfectly layered shots with well-defined colors. The tallest on the far left is called a caballito and is designed specifically for tequila. I enjoy using a flight (or line-up) of these for comparing tequilas. The margarita glass is used primarily for serving margaritas, though those cocktails can also be served in a cocktail glass. The double-bowl shape of the margarita glass is a fun and distinctive shape that works particularly well for frozen margaritas. The wide rim makes it easy to add a salt or sugar rim. Margarita glasses can come in a variety of sizes and can range anywhere from 6 to 20 ounces. The smaller glasses are nice for drinks with no ice. The medium glasses are good for frozen drinks. The large bowls are good for large frozen drinks served or those with a lot of ice. Some margarita bowls can get to ridiculous sizes, topping off at 60 ounces. These would only be good as a novelty to share with a table-full of friends (each with your own straw, of course). If you enjoy a Champagne cocktail every once in a while, then a set of Champagne glasses would be a nice investment. They come in a variety of shapes. It is often best to purchase a set of 4 or 8 glasses, depending on the size of your average Champagne-worthy celebrations. This tall, thin glass has a tapered rim that is designed to keep the Champagne's bubbles in the glass longer. Flutes typically hold between 7 and 11 ounces. Flutes are perfect for the simple addition of a single berry garnish. The fizz fountain of the traditional Champagne Cocktail is spectacular in a flute. This elegantly styled glass has the longer stem and bowl of the flute, the difference is that the rim flares out instead of in. This design will not trap bubbles, but it is a nice option for mixing Champagne and other sparkling wines. The saucer (or coupe glass) is a more traditional glass design used to serve sparkling wines. It is a flatter, rounder bowl and holds just around 6-8 ounces. Saucers are nice for serving straight Champagne to many guests (filling well below the rim to avoid spills) because they will drink it rather quick. Use it to add an elegant twist to drinks that you would serve in a cocktail glass. Use it for a roaring '20's themed party. A perfect choice when you want to float a larger slice of fruit on top of the drink. Wine glasses could be the topic of a separate article. There are so many shapes available and many styles have been developed to showcase a particular style of wine. White Wine Glass: the taller, more open glasses (on the left). Red Wine Glass: the rounder, smaller bowl (on the right). A wine glass of any style is perfect for serving wine cocktails. Those with ice are often best in a white wine glass. Just like wine, beer has its own list of glassware that can be used, these are just three examples. They can be used interchangeably and are good for mixing beer drinks. Pints typically hold 16 ounces. Best when pulled straight from the freezer. This is also a mixing glass and can be used as a piece in a Boston shaker set. Pilsners typically hold between 10 and 14 ounces. Tthe unique fluted shape (which can be more or less exaggerated) is used most often for light beers and the wider rim still allows for a good head. Mugs are nice because you can hold your beer without warming it with your hands and they are also best when frosted. The volume of a beer mug will vary greatly. Many will hold between 10 and 14 ounces. A thicker base (such as the one in the photo) barely holding 10 ounces. You may see these deceptively smaller ones at bars because they allow for a shorter pour. If you don't care about draught beer, you will get more beer by going with a bottle. Here we have a few tall specialty glasses that you will run into in cocktail recipes. Each has a specific style of drink which they are used for. 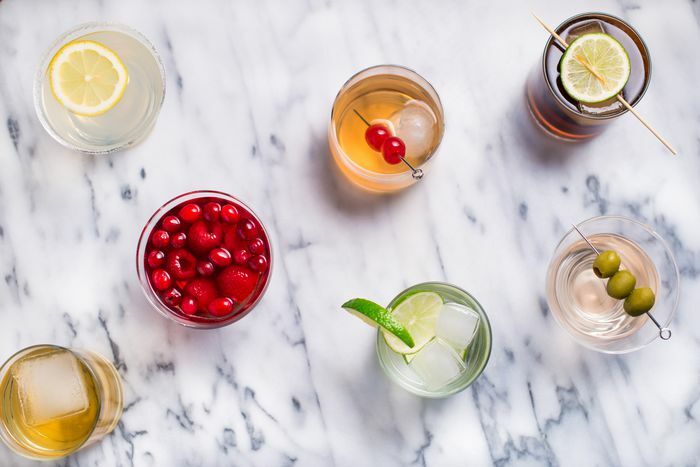 While they are not called for as often as the previous glasses, they are useful to have around, particularly if you are fond of any of these cocktails. This footed glass is used for hot drinks and, traditionally, for an Irish Coffee. It is a nicer way to present warm drinks than the average mug. Are made with heat-resistant glass. Typically hold between 8 and 10 ounces. The distinct pear-shaped curve of this glass is reminiscent of vintage hurricane lamps, which gave it its name. It is used for the aptly named Hurricane Cocktail and often for Pina Coladas and other frozen drinks. Typically hold between 10 and 12 ounces. As the name implies, this glass is used for brandy, particularly sipping it straight. Though it is a very large glass, only a standard pour of around 2 ounces goes inside. The idea behind the snifter is to allow the drinker to enjoy all of the aspects of brandy: watch it swirl inside, notice its legs and color, take in the aromas trapped in the bowl and slowly take a sip. It is also used for a few simple brandy drinks, most notably the aromatic B&B. If you enjoy fine brandy, or any dark spirit for that matter, this will be an essential glass for you. You will probably not use these glasses often, but it is good to be aware of these three short specialty glasses. Used for Whiskey Sours and other simple sour drinks, this little glass is made to enjoy small drinks as it holds just between 3 and 6 ounces. These tiny glasses are a traditional way to sip cordials (or liqueurs) straight and are not very common today. They are dainty, holding just 2-3 ounces. These are particularly fun to collect on the vintage market because the styles varied greatly. I even have a miniature cocktail glass that is so very cute! This glass is also used to sip cordials, but more specifically used to drink genever in true Dutch fashion. The custom goes: place the glass on the bar and fill all the way to the rim with ice-cold genever, then lean over and (without hands) take a long (often loud) sip off the top. It's quite fun! Note: Most tulips are clear glass as well; mine in the photo just happens to be black.